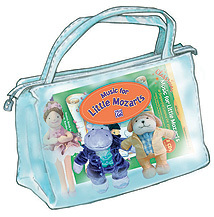 Perfect for teachers with all levels of musical training, the Classroom Music for Little Mozarts Deluxe Curriculum Kit 3 with CD includes all of the songs, stories, plush characters and lesson plans necessary to teach music to children ages 4, 5 or 6 in the early childhood classroom. Plush characters Haydn Hippo, Nina Ballerina and Puccini Pooch are included to help the music lesson come alive for the students. The curriculum book includes well-sequenced and quickly paced lesson plans with a correlating CD that includes all of the songs, stories and activities. Reproducible pages provide fun activities for children to do after the lesson. All contained in a handy tote bag, this 10-lesson program is the perfect teacher resource for getting young children involved in a comprehensive musical experience that involves singing, movement, listening skills and musical concepts. Assessment materials and correlations to the National Standards for Music Education are also included.